Here you are my second interview. i've made it to Mette from u n g t b l o d, again one of the blog I read daily. 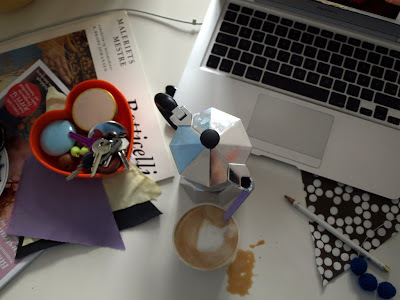 I asked her to send me a picture of her desk (where she mostly works on the blog). Me. I have tagged your blog into my bookmarks with the tag " lifestyle ", if you'd give only one tag to describe your u n g t b l o d, what term would you use? Mette. I think " lifestyle " is the best tag you could give my blog. When people ask me what i blog about, I never quite know what to answer: myself? my life? my dog? my kid? It really is about me and my family and the way we live. Me. What is the triggering reason that make you create a blog? Mette. I started reading blogs a little over two years ago and found so much inspiration in them. I was really drawn to the personal blogs - the blogs showing the lifestyle of someone with taste and talent - and I wanted to start viewing my own life through a lens - seeing, magnifying and remembering all the good stuff in my life. Me. Tell me a little bit about the process of reserarching inspirations for your blog, where do the ideas come from? Mette. The inspiration for what I post comes from my life, so there is really no research involved. But a lot of the stuff I do in my life is inspired by things I see online and by the blogs I read. I get all the blogs I follow in my Google reader and I subscribe to hundreds. They are sorted into categories and in minutes I can read through lots of blog posts. I use Googles sharing - function to remember all the good stuff I see and then I save pictures in folders on my computer, often keeping a ton of photos and sites open on my laptop. Me. How many hours do you dedicate to the blog daily/weekly? Mette. It varies a lot. I usually spend 15 minutes preparing the post it self - more if there are many comments to answer - but add to that the time it takes to photograph and to edit the photos and it will be a bit more. I try not to spend too long on each post. I mostly write about myself and my own life and the photos are the center of my blog, so I just try to be as honest and forthright as possible. Me. What does a typical day at work involve for you? Mette. Right now I am at home with my three month old daughter, Elinor. So my days are spend trying to get as much fun and productive stuff done when she is napping and otherwise spending all my time with her. When I'm not a full time mother, I am a student. I have a Bachelor in Rhetorics and I recently started following courses to get my masters in Digital design and communication. And I spend a lot of time at home! I love being home: studying, spending time with my husband and our dog, sewing, taking pictures, decorating, drinking lots of good coffee and being online. Me. Do you collaborate with mag or other blogs? If possible, what? Mette. No (not yet :) ) - i just did my first sponsored give away in collaboration with Adeline Affre. Its very important to me, that I can get 100% behind everything on my blog. Me. How many time do you dedicate by reading other blogs? Mette. It really really varies depending on how much time I have on my hands. I subscribe to A LOT of blogs and I try to read approximately 50 blogs daily - commenting on maybe 10. The rest of the 759 blogs in my Google reader, I try to visit maybe once a week. Its very difficult to find time to comment as much as I would like and I don't click on links as much as I used to, but I do spend a lot of my free time on blogs. Me. What tips can you get to someone that will start a blog? Mette. Its very important to find your own style and blog about something that is important to you. If your blog isn't authentic and isn't " you " - it won't last long. Another very important thing is to find your network. Find a group of blogs that speaks to you and build a relationship with these blogs. Commenting on other peoples blogs is a big and important part of being a blogger. I don't think there is any idea in just broadcasting your life to the world - you have to take part in the blogging community! This is also what will make blogging matter in your life! Me. Which are your favourite blogs by the moment? What tag describes them in a better way? Mette. Uhh this is difficult! Really you should just look through my blog roll because there are soooo many great blogs out there. If I have to name names I would say, that the blogs of the two swedish sisters Emma and Lisen Adbåge illustrate the kind of blog i really like: they have personality, authenticity and talent! Me. What are you looking forward to? Mette. Visiting my own blog in a couple of years and looking back on how my life has evolved. Thanks a lot Mette (and also Elinor! ).